What can one say about the Ninth of Robert Simpson, except that its gestures are confident and its control of pace and its material are masterly? ... 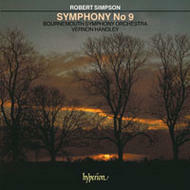 It is played superbly by the Bournemouth Symphony Orchestra under Vernon Handley, and is no less superbly recorded.